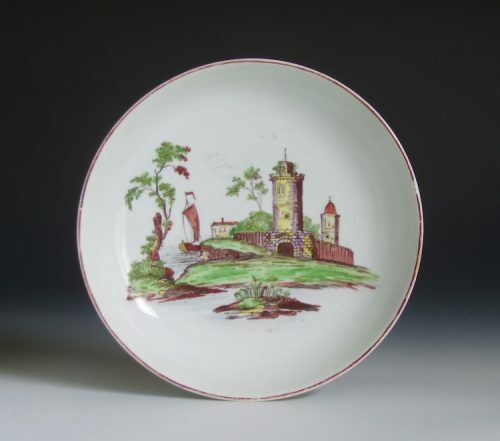 Home / Longton Hall / Longton Hall porcelain saucer dish. Longton Hall porcelain saucer dish. Painted by ‘The Castle Painter’ with a turreted castle on an island, with a church tower within a fenced enclosure and a sailing ship on the left, brown line rim. This style of decoration is traditionally attributed to John Hayfield who is listed as a painter at the factory in an agreement in 1755.